All goods are carefully packaged and sent using the highly efficient Japanese postal service. 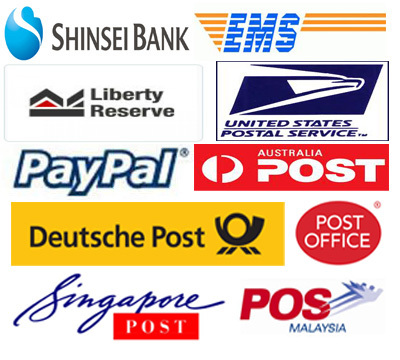 Purchased items are shipped by express registered mail - EMS. All international orders are subject to any applicable customs duties and associated assessments and fees. This remains entirely the responsibility of the purchaser. UK Orders - Recent orders shipped to the UK via International Air Parcel Post (Parcel Force in UK) have been charged 12% Import Duty (on items classed as 'luxury' goods); 17.5% VAT plus £5.25 Customs clearance fee. Canada Orders - For an order with EMS shipping, please be sure to include the telephone number for the forwarding address. Delivery times are normally 7-10 business days for normal mail and 3-4 business days for EMS, though this may vary according to the country shipped to. *Weight limits vary by country or area. Reshipping - If an item is returned to us due to the fact that the shipping address supplied at the time of purchase was incorrect or no longer valid or no one was home at the time of delivery, we will resend the item but these and all further shipping costs are the responsibility of the purchaser. The same policy holds true in the event of a clothing item, etc., that does not fit but was shipped by SuTo Corp.com as ordered by the client. Always double-check the sizes as noted on the site.